Monsoon Axis "Falls of the Hook" !! 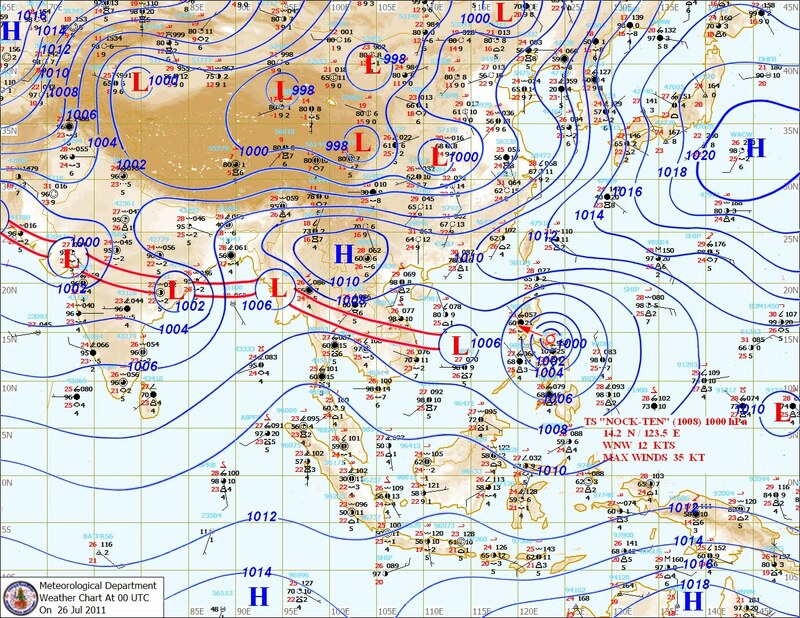 Yesterday’s Monsoon trough line on Vagaries Map is the Normal Position for this time. Just observed it has slid South. If it remains in this position for next 24 hrs: Then with embedded UACs in it, it can bring very good rainfall to Gujarat, North interior Mah. And Vid and North A.P. It can re-activate the west coast off shore trough (meaning enhanced rains for Mumbai), and it also indicates the MJO will remain active for another week beyond 26th July. Please let us not jump to any conclusion , as the axis can move back North in next 12 hrs.Wait and watch. What? What does the mean for the season? And Mumbai? till when will the dry MJO phase last??? That's weired - the Monsoon axis coming so South. No matter what happens, I am convinced that Mumbai will get rains!! That's been the pattern over the last couple of years. 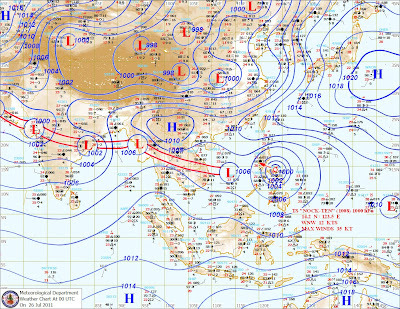 If it's not a UAC, then it's a Depression, if it's not the offshore trough then it's the localised heating, now the Monsoon trough decides to get into the act!! Where are the days when we used to see a complete 'break' monsoon? Only partly cloudy skies with the odd shower? I think North Konkan is in for a drenching for the next many years to come. Pardon me if this sounds a bit over the top for folks who are not in Mumbai - but 70 inches rain (Mumbai - SCZ) in around 50 days does get a bit too much and we are yet to encounter August and September!! On a completely different note - i think the axis has slid further down then what the IMD claims - it is just over Mumbai if you ask me (just looking at the satelite image). Also, today happens to be one of the most infamous day in the history of Mumbai Monsoon, just thought of bringing that up. 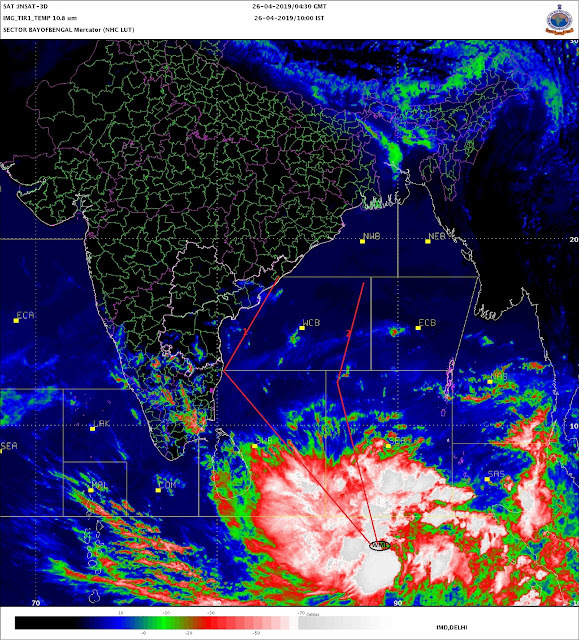 @Rajesh yes, the monsoon axis which runs from baroda to vizag will result in formation of low off Andhra coast by friday. Most forecast model r expecting vortex formation off konkan coast bcoz of bay low. 'Flooding rains' r expected for Sindhudurg, Ratnagiri n Raigad district from friday to sunday. Mumbai also will get heavy rains from saturday but not as heavy as south konkan. Heaviest rains in Mumbai could be on sunday/monday. But monsoon this season has been erratic, things can change very quickly. @Rajesh, whats ur views on this. The IMD says that there is a UAC around North Coastal AP and adjoining BOB which can translate into a Low Pressure. Where is the clouding around the system? I see hardly any clouding. According to me this is the third system this season in the BOB which seems to be devoid of any clouding. What is the reason? been raining heavily for the past half hour..was this on the cards?? was reading through imd report...sayss a low pressure may develop over west central BOB...so rains for mumbai?? ?